I was heartbroken when I first heard Bruce Naftaly’s voicemail message this morning, letting me know that he and his wife and business partner Sara had decided to close Le Gourmand and Sambar in early June. I’ve been a card-carrying fan of Le Gourmand for many years, and of Sambar from the first French 75 I sipped on that glorious garden patio. How could the news be true? But a few minutes later when I had a chance to talk with Bruce directly, I started to feel a bit better. Still sad. As is he, most certainly. Though hearing him talk of the good that’s around the corner, the opportunities that await, the new adventures that their future holds — I’m more heartened, less heart-broken. A sad as I am for myself and the now-limited prospects of future Le Gourmand and Sambar indulgences (poor, poor me!! ), I’m as sad for the city. Seattle is losing one of the pillars of local cuisine, thoughtful cooking, and distinctive culinary passion. But I’m cheered to reflect on how fortunate I feel to have been able to follow Bruce and Sara and their wonderful restaurants so closely over the years. I’ve already got a dinner booked at Le Gourmand next month and will try to hit Sambar as often as possible between now and June 2, the date they expect to be their final bow to a most grateful community of diners. There may be another chef in town who’s stayed as committed to his own stoves as Bruce has been, but if there is I’m not sure who that is. I think probably without exception, every dinner service that Le Gourmand’s had for the last 27 years has been conducted by Bruce personally, always at the helm of his own ship. He doesn’t march to the same drummer that most chefs today feel compelled to. He’s not donning the “good” chef’s coat that’s for show to go off to another food and wine festival cooking for high-end ticket holders, not on media tours, not off filming a TV segment or other stops on the celebrity chef circuit. In the early days, Bruce told me, if he wanted to go to a concert or something along those lines, he’d just close the restaurant for that night. But he only did so very early on in the life of Le Gourmand. Since then, his devotion has been complete. The only vacation taken comes in the first week of January each year. He does his own bookkeeping, marketing, really he and Sara run the whole joint on their own. Bruce even washed and ironed all the restaurant’s tablecloths early on, until he found a linen service that offered the quality of cotten linens he wanted. “This has been my life,” he told me. Now he can drum up a hobby or two, read a book, write a book perhaps? Maybe even carve out some time to rediscover music, the thing that brought him to Seattle in the first place, coming here initially to study voice. When the doors close, it’ll be the end of one chapter that had great impact on the city. As I’ve said more than a few times in the past, Bruce Naftaly has quietly been on of the most important food pioneers in Seattle. So often just naturally ahead of the curve by way of following his own muses. He was making charcuterie at Les Copains, which opened in Wallingford in 1979 (and closed just a couple years later). He began acknowledging farmers, fishers and other purveyors on his Le Gourmand menu from the day it opened in 1985. He’s been living the farm-to-table mantra since long before that connection was novel enough to merit a catchy name. His own garden, his neighbor’s fruit tree, a farmers market — wherever it was, as close to his kitchen as possible, that he could get great products, that’s where he went. When Sambar opened 8 years ago, all lines between the bar and kitchen were wiped out, with verjus, rose pedals, fresh ginger and shiso leaf making their way into the cocktail glasses. But it’s just the end of that chapter, by all accounts. Bruce says that he’ll still be teaching cooking classes. He thinks Le Gourmand and Sambar both can perhaps live on in pop-up form, for special events and private dinner parties. There are any number of ways that legacy will live on. It just may not be in that charming, understated brick building at the corner of 6th Avenue NW and Market in Ballard. So, it’s time. Time for you to plan a return visit or two to Le Gourmand and Sambar over the next few months. And it’s time for Bruce and Sara and their now 12-year-old son Sam to dream about what they might do for summer vacation this year. I would love to join you both at Sambar with a salutary toast and Le Gourmand for a final feast in the next few months. Only fitting as I’ve enjoyed my several visits there in your company. 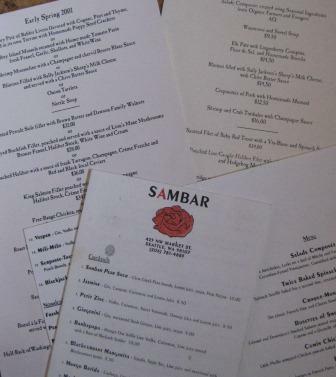 Perhaps several toasts at Sambar as one of their creative concoctions is never enough.